"Well, as far as I'm concerned [submarines] are no life for a dog�even a sea dog. I'd much rather sink 'em than sail 'em any day." Produced at the height of World War II, Crash Dive is a good old-fashioned, rousing propaganda film, chock full of patriotism, heroic acts, noble sacrifices, and plenty of Hollywood glamour. Archie Mayo's assembly line antique delivers exactly what we expect from a wartime yarn�a predictable plot line, heavy-handed foreshadowing, and a crowd-pleasing climax�all of which make the movie as comfortable and durable as an old shoe. Although it contains little nail-biting tension and few of the claustrophobic confrontations that distinguish the greatest submarine films, Crash Dive effectively created the submarine genre. And 20th Century Fox pulled out all the stops to showcase its inventive idea�Technicolor photography, location shooting at the U.S. Submarine Base in New London, Connecticut, and its number one box office draw, Tyrone Power. Such formidable elements can't camouflage the thin plot and war movie clich�s, but they keep Crash Dive moving and on course. Don't be fooled, however, by the DVD cover art. Sure, the cast is submerged in the Atlantic a good bit of the time, but an awful lot of Crash Dive remains anchored on dry land. So much, in fact, it's often a toss-up as to which conflict receives more attention�America's pursuit of the Nazis or Power's pursuit of love interest Anne Baxter. The film's romantic emphasis isn't surprising, considering Power's enormous female following, but its lightweight nature is. For a serious war drama, Crash Dive features far too many cutesy episodes and jaunty exchanges. Still, it all somehow works, in that trite, charming, 1940s kind of way. Power portrays Lt. Ward Stewart, a PT boat commander from a long line of military stalwarts, who grudgingly accepts a submarine assignment because that's where his country needs him. Before he ships out, Stewart takes a personal trip to Washington, D.C., where he meets fresh-faced schoolteacher Jean Hewlett (Baxter). Jean tries her best to deflect Stewart's aggressive advances, because, unbeknownst to him, she's involved with his commanding officer, Lt. Commander Dewey Connors (Dana Andrews). As the war heats up, so does the love triangle, causing friction on the sub, and putting the dangerous task of destroying a Nazi supply base on a remote island in jeopardy. Crash Dive accurately depicts the submarine culture and gives viewers an inkling of the cramped atmosphere on board. The location shooting adds authenticity and opens up the drama, and supporting actors James Gleason, Harry Morgan, and Ben Carter reflect the salty personalities of the crew. Although the flashy battle scenes dazzle the senses, they more closely resemble choreographed pyrotechnics than real warfare. In this era of cutting edge visual wizardry, it's tough to believe the cheesy special effects in Crash Dive garnered an Oscar, but apparently the film's Technicolor explosions sufficiently swayed Academy voters. Power and Andrews sport irrepressible cocky grins, while projecting potent movie star magnetism. Both men could sleepwalk through their roles, but inject their portrayals with appropriate spirit and sincerity. The young Baxter tries her best with an insipid part, but doesn't yet exhibit the maturity and poise that would distinguish her work in All About Eve seven years later. She's strictly an ing�nue here, and a dull one at that. Crash Dive will never be remembered as a great submarine film, or even a great film, but it's an entertaining amble down memory lane and comfort food for a classic movie lover's soul. When it's over, it leaves us wishing current wars could be so neat and tidy, so black-and-white, and end with a wink, nod, and kiss. Sadly, those days are long gone. Image Transfer Review: Crash Dive is presented in its original full-frame aspect ratio, but the source print is a mixed bag. At times, the transfer possesses lusciously rich, beautifully saturated Technicolor hues, but a lush scene is often followed by a washed out, pale sequence with no luster. As a result, fleshtones fluctuate, and details are often obscured. Grain is ever present but never overwhelming, and close-ups enjoy good clarity, although color shifts often occur in mid-scene. Audio Transfer Review: The stereo track is relatively clean, and features clear dialogue and solid presence. The patriotic score nicely fills the room, and bass frequencies shine. The original mono track is also included. 3 Other Trailer(s) featuring The Hunters, Morituri, What Price Glory? Extras Review: The film's original trailer and a few previews for other Fox war classics are the only extras offered. 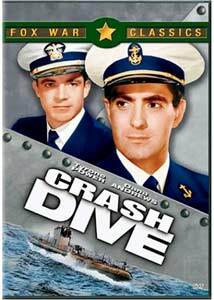 Tyrone Power fans will welcome the release of Crash Dive, and although the first Hollywood submarine film serves up a hefty platter of patriotic corn (and features too much gooey romance), this breezy star vehicle reminds us why we love World War II movies and all their dyed-in-the-wool clich�s. Only an uneven transfer keeps the film from earning its stripes.